Days before they met in the 36-hole final of the San Francisco City Championship, Evan Peterson ran into Jason Anthony after their respective first-round matches at TPC Harding Park. Peterson, a redshirt junior on the St. Mary’s team, had been off the course for some time after defeating his first-round opponent, 7 and 5. Post-round, Peterson expressed some remorse for ending another player’s day so quickly. Anthony, the 35-year-old defending champion, gave some sage but simple advice: Don’t worry about it, just step on him. Peterson didn’t let up in his 36-hole showdown with the defending champion, but Anthony didn’t make it easy. With both men playing well, the match was competitive well into the afternoon round. Peterson took an early lead on the second 18 – building his advantage to as much as 5 up by the fifth hole – before losing the tee on No. 6 with a bogey. He didn’t get the tee back again until No. 13. It was the kind of day where the caliber of golf was celebrated – by both players. When Peterson dropped long putt on No. 12, Anthony fist bumped him before hitting his own shot. Ultimately, Anthony just ran out of holes against the collegian. Peterson chipped in for par on 13, the two tied 14 and then Anthony conceded on the 15th, giving Peterson a 5-and-3 victory. “He’s a great guy, awesome competitor,” Peterson said of Anthony, a familiar face even before this week. Both players are members at Green Valley Country Club in Fairfield, Calif.
For Peterson, the San Francisco City title is the biggest win of his career. He has spent the past few seasons gunning for a recurring role in the St. Mary’s lineup, but has only made roughly half a dozen starts with the team in his time there. “I have a year left to play next year. This will hopefully be the jumping point I need to start playing well,” Peterson said. TPC Harding Park is roughly 45 minutes from campus, and while St. Mary’s coach Scott Hardy couldn’t be on the grounds Sunday – he sent an inspirational text instead – Peterson’s dad was. He caddied for his son over the weekend, getting a front-row seat to a master performance. Peterson is a student of the game in every sense, ticking off winners of this event from Ken Venturi and Harvie Ward to Cody Blick and Martin Trainer. The latter won a PGA Tour event last month, which gives Peterson hope. Peterson learned to be a strong match-play competitor during league play at Central Valley as well as in high-school matches. The way he put words to that skill on Sunday night gave a window into his work at Harding Park. 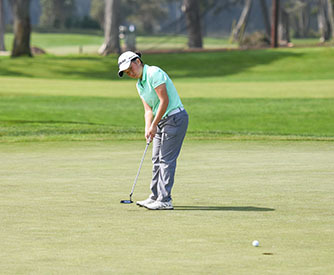 In the women's division, also contested at TPC Harding Park, it was a similar marathon for eventual winner Danielle Suh. The 17-year-old San Francisco native called the City title the first major amateur win of her career. It took two extra holes, but Suh eventually defeated Aman Sangha on the 38th hole of the day on Sunday. Before her marathon final match, Suh had also gone 16 holes in Saturday morning's quarterfinals and 17 holes in that afternoons semifinal match. Needless to say, it was a long weekend for Suh, but completely worth it.